Slough Jets travelled to Shropshire to face the Telford Tigers on their home ice 8 days after their last encounter on Hangar Ice. Slough took a lead after 16.20 when Ales Padelek scored against Declan Ryan starting in net for the home team. Despite the Slough netminder being the busier of the two the first period ended with the home team down by a goal. The margin increased in the second period early on when Padelek netted his second at 21.41 and then Matt Towalski made it 0-3 at 29.38 and Telford swapped their netminder with Sam Gospel taking over. It took a powerplay chance while Padelek sat out a high sticking call for Telford to score when Miika Kiriranta scored at 35.15. Natham Salem pulled the deficit back to a single goal at 38.44 and ensured there was all to play for in the final period. With the game wide open Kamil Tvrdek’s goal at 45.04 put Slough firmly in the driving seat, leaving the home team having to fight back into the game. With time running out Slough took a time out at 54.16, Telford did the same at 57.56 and pulled their goaltender for the final 1.32 of the game but couldn’t fight back into the contest and Slough took the win. 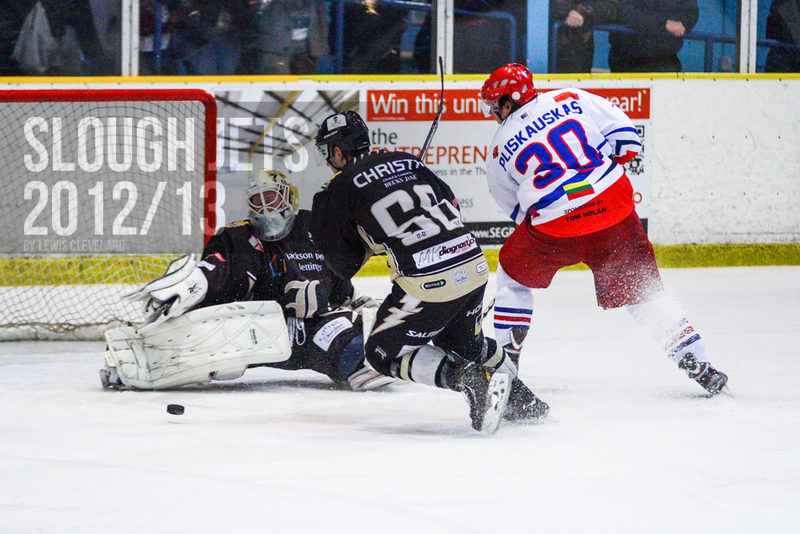 Both teams got to use their special teams in the first period as they both served 4 minutes in penalties but at 15.59 at even strength Leigh Jamieson netted the go ahead goal for the visitors for a 0-1 first period. Penalties continued in the second period but this time Slough converted the opportunities to end the period ahead. Mindy Kieras netted at 29.54 while Lukas Zatopek served a holdng call and Michael Wales gave the home team the lead and neted the go ahead goal, again on the powerplay, this time while Adam Carr served a holding penalty. The final period got underway with Slough leading and more penalties were called. Eventually tension boiled over when heavily penalised Adam Greener was pushed beyond breaking point by a check from behind from Grant McPherson and the two players came together. Greener’s victory earned him 2+2 for roughing and a 5+game adjudged for resisting the linesmen and McPherson also got 2+2 for roughing and 2+10 for the original check from behind. Milton Keynes hit penalty trouble towards the end of the game but still managed to call their time-out and take the empty net gamble but with Slough on the powerplay the empty net target was too wide for Matt Towalski to miss with Slough’s third powerplay goal of the night with just 42 seconds remaining. It took just 166 seconds for Sheffield to take the lead when Andrew Hirst beat Gregg Rockman for the games opening goal. With little in between the teams Mindy Kieras levelled the game at 13.23 and both teams shared the spoils of the first period. Back in the second period and Slough outshot their opponents but it was another split period with Sheffield going back ahead at 27.27 with a Ozolins goal before Darius Pliskauskas levelled the game at 2-2 with his 33.42 goal. Slough dominated the shooting in the third period, outshooting Sheffield by 14-6 but Gomenuik put the home team ahead with 11.46 left in the game. Payette called the Sheffield time-out at 48.39 and later Doug Sheppard called the Slough time-out at 57.54. For the second time in the weekend Slough lost out on the empty net gamble as Ozolins scored at 59.41 while Slough used the extra attacker. Slough Jets and Swindon Wildcats braved the weather to put on one of only two games to take place in the Premier League. Slough took the lead early on when Blaz Emersic beat Geoff Woolhouse in the Swindon net with a shorthanded goal at 3.57, 15 seconds into the penalty kill. Swindon made the next penalty to be called count as 7 seconds in they equalised when Aaron Nell scored at 8.45. Both teams generated chances and with 15 seconds left in the period Ryan Watt scored the go ahead goal to make it a 2-1 period. The second period brought an end to the scoring but saw a good defensive performance from Swindon killing off 8 minutes of penalties. Emersic scored his second to put the home team two goals ahead at 21.53 but Swindon fought back with their second at 26.13 from Jason Cassells. Swindon killed off two further penalties but Slough failed to score at the period ended 3-2. The third period saw both teams turn up their offence but neither could beat the opposing netminders. Slough killed off two penalties before it was Swindons turn to penalty kill and at 51.21 Jan Krajicek received a 10 minute misconduct ending his game. Swindon called a time-out with 48 seconds remaining but Slough maintained enough offensive pressure to restrict the visitors to just 15 seconds of empty net time and held on for the win.